Prime Minister Sheikh Hasina on Wednesday said she thinks she had been able to brighten Bangladesh’s positive image through playing a strong role in the 73rd session of the United Nations General Assembly (UNGA) in New York. “I and my entourage attended various forums of the UNGA from morning till night on September 23-28. We tried to portray a positive Bangladesh before the world leaders. I think we had been able to brighten Bangladesh’s positive image through playing a strong role in the 73rd United Nations General Assembly,” she said on Wednesday. The Prime Minister said this in a written speech at a press conference at her official residence Ganobhaban on the outcome of her recent weeklong visit to the United States to attend the 73rd UNGA session. She also said Bangladesh approved five joint declarations, including one on global peace and two on the operations on protecting global peace, in the UNGA session. Sheikh Hasina said she received the “International Achievement Award” from the Inter Press Service news agency for her exemplary humanitarian response to over 1 million displaced Rohingyas by giving them shelter. Global Hope Coalition’s Board of Directors also adorned her with the “2018 Special Recognition for Outstanding Leadership Award” for her farsighted leadership to deal with the Rohingya crisis. The Prime Minister said at some high-level meetings, she highlighted various initiatives taken by the Bangladesh government for the sustainable solution to the Rohingya problem and sought cooperation from the world community. During her meeting with US Secretary of State Mike Pompeo, Sheikh Hasina said, she raised the issue of the extradition of Rashed Chowdhury, a convicted killer of Father of the Nation Bangabandhu Sheikh Mujibur Rahman, and also handed over a letter to him to this end. On September 27, the Prime Minister addressed the 73rd UNGA session at the UN Headquarters in New York in Bangla and held a meeting with UN Secretary General Antonio Guterres. 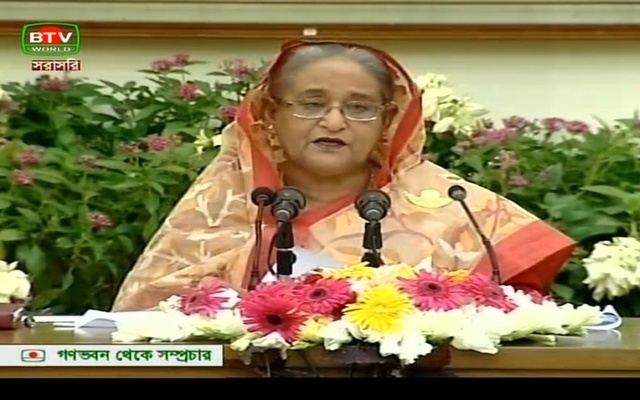 In her speech, she highlighted the successes of her government over the last nine and a half years in various sectors, including education, health, power, women empowerment, establishing Digital Bangladesh and upholding the continuity of democracy. “Besides, I raised various issues like Rohingya problem, establishing global peace, safe migration and protection of the rights of the Palestine’s people,” she said. On the sidelines of the UNGA, the Prime Minister said, she held bilateral meetings with a good number of eminent personalities, including Dutch Queen Maxima, Estonian President Kersti Kaljulaid, US Secretary of State Mike Pompeo, President of the 73rd UNGA Maria Fernanda Espinosa Garces, United Nations High Commissioner for Refugees Filippo Grandi and US Senator Jeffrey Alan Merkley. She also attended a welcome reception hosted by US President Donald Trump, she said. Sheikh Hasina said she also joined a number of high-level events on the Rohingya crisis, cyber security, peacekeeping, women empowerment, girl education, sustainable development in fourth industrial revolution, climate change and global drug problem. She also joined a luncheon and roundtable meeting arranged by the US Chamber of Commerce, the Prime Minister said. Sheikh Hasina attended a civic reception accorded to her by expatriate Bangladeshis living in the USA. PM’s Press Secretary Ihsanul Karim moderated the press conference.